There are a lot of myths and misconceptions around astrology, both about what it is and how to understand its symbols. Should you really stop dating this wonderful guy / gal you met just because he’s an Aries and you’re a Taurus? And is there really a 13th sign? It’s usually the media that is to blame for the perpetuation of these myths with several half-baked ideas being percolated around by non-astrologers. These tend to be well meaning (and sometimes not so well meaning) folk who don’t know much about astrology other than what they see in the media or what they hear by word of mouth and don’t have the time, inclination or interest to delve more deeply into the subject. So, we thought it prudent to debunk some of these astrology myths for you, our wise and knowledgable readers, and give you the real story. Here goes. 1. You shouldn’t date someone whose star sign is incompatible to yours. Poppycock! We sincerely hope you have never followed such advice. Maybe someone will also tell you that blue does not go with brown or that you can’t combine oranges with chocolate. But that doesn’t mean you should throw out your favourite jumper and it didn’t deter Terry from coming up with the chocolate orange. It’s true that star signs of matching elements (e.g. earth-water, fire-air) find it easier to get along than clashing signs. But that doesn’t mean they also fancy each other! You need some friction to generate a spark and mere star sign compatibility won’t give you that. Love is a mysterious thing. Birth-chart compatibility is a complex matter and even then, the final choice rests with you. Each person is free to choose the kind of relationship they want. Do you want a walk in the park? Do you a walk through fire? A full birth chart analysis can shed light on what you are seeking in love and the kinds (plural) of person that could fit that image. 2. Mercury retrograde is a time to…be afraid. Be very afraid! Do nothing! Naaah. Mercury retrograde has found its way into pop culture as a holdall for mishaps, obstacles and delays to the point where it’s become a caricature of itself. Words without meaning. “Ah I mixed up the times, Mercury must be retrograde. Oh, I forgot to send that email. I blame Mercury retrograde. My train was delayed. Is Mercury retrograde again?” It’s as if someone started using the word “flibble” regularly in conversation having no idea what it actually meant and everyone else joined in. But while Mercury retrograde can disrupt the smooth flow of our perceptions (maya), it’s really much more than a pointless blip in communications. It is a time to look inward. An opportunity to hit the reset button in your thinking and let new ideas be born. And you can’t do that while you’re running around chasing emails now, can you? So the computer sometimes has to go kaput for you to sit up and take notice. Like anything in nature, our brains (and also our relationships (Venus) or libido (Mars))) do need periodical down time for maintenance. It’s called introspection. Mercury retrograde is such a time. Indeed, Mercury retrograde can be a magical time of unforgettable memories! It can be a time of discovery, creativity, inspiration. But if you insist on chasing deadlines, then it will forever remain an annoying electronic blip. Never has more ridiculous astro-babble been spoken! There’s no sell-by date on your star sign. And as for your Ascendant (or Rising Sign), you’re very much it from birth. Your Ascendant is the face you present to the world, the way you ‘meet’ life. Sure, you might become more adept at meeting life as you grow older but that’s as far as this simile goes. You don’t suddenly turn into someone else. If anything, it is your Sun Sign that can remain hidden for a while - especially if the rest of your birth-chart emphasises other features. In fact, children tend to exhibit their moon signs first, because things like will (Sun), taste (Venus), thought (Mercury), aggression (Mars) and others that make up the full personality take longer to develop. Arguably, the sun sign is often one of the last to fully shine through as it represents your innermost self and purpose in life. So, a person could spend years not feeling like a typical Taurus or Cancer before they get to know themselves. As for the Ascendant, it is always visible, always there. It’s the shop window, the frontispiece, the mask you wear for all to see. And you start wearing said mask way before age 30. 4. I’m both signs, I was born “on the cusp”! Having said that, some people just won’t be told. That is why we have a whole article dedicated to Born on the Cusp so you die-hard cuspers can gorge on it and be happy. Often what happens is that those who feel strongly about being cuspers have a whole cluster of planets in the adjacent sign. And so they’re right in thinking they’re both signs. But not because their Sun is on any ‘cusp’. At a push, we can talk of people being “born on the cusp” simply by defining a cusp as the 29th degree of a sign till the 1st of the next one. These are called critical degrees in astrology and they do have meaning but not in the way you’d think. Some astrologers do believe that the closer you get to the edges, there’s some star sign bleed through. But most astrologers would argue the opposite. That being born on critical degrees makes you even more strongly your star sign, not less! It’s like you said "…not yet, not yet, not yet — now!” Or “quickly let me get my foot in the door before it’s too late!” And so you’re definitely a hundred percent your star sign. Think what you will. 5. Astrology can’t possibly be right because it lumps millions of people together across 12 sun signs. Uh, no! Astrology is far more than sun signs, i.e. the star sign that you were born under. Each individual has a unique, personal birth-chart based on the position of the Sun, Moon, planets, angles and stars, their Ascendant and houses as well as many other factors. In fact, the universe is so vast you could analyse a single birth-chart for all eternity! Since we don’t have an eternity, you can start with a computer analysis that will give you a taster, while a full reading by a competent astrologer will synthesise it all to begin building a unique picture of YOU. Let’s reiterate. Your birth-chart is unique! Even twins are born minutes apart. No two people are born in the exact same square foot and moment and this is why no two charts are alike. And still, you might say: there’s something I and millions of other people share, according to astrology, namely my star sign! How’s that work out? Well don’t you? Star signs are archetypes. Archetypes of love, courage, community… And these are experiences we all share in common. 6. The star signs are the same as the constellations in the sky. Erm, No. This is a gross misconception. The star signs are derived from their constellations but are not identical to them. First of all, every star sign is exactly thirty degrees long, together making a neat circle of 360. Nothing of the sort exists in reality. If you study the skies, you will find that the constellations are all over the place. Virgo spans across a large swathe of the heavens as it’s one of the largest constellations, whereas Aries and Capricorn are pretty small. The Sun spends 40 days in the constellation of Virgo, only 25 in that of Aries, 23 in Capricornus and a measly 7 days in the Scorpion. But none of that matters. For the zodiac signs are not the constellations. So what is the zodiac? It’s a giant clock! The twelve “hours” of this clock are the twelve zodiac signs - all of equal length - named after the stars, and the dials are the Sun, Moon, planets and points. This clock’s main purpose is to assess the quality of time, to give it meaning. Western astrology uses a “tropical zodiac” which identifies the spring Equinox with the Sun’s entry into the zodiac sign Aries at around March 21st. Note that this presently has nothing to do with the constellation Aries or with its mythology, or with when the Sun crosses said constellation in the skies. By contrast, the temporal segment that is the zodiac sign Aries and begins at the Spring Equinox lasting a month in fact symbolises renewal, freshness and courage - the first shoots of spring. 7. The zodiac has changed! There is a 13th sign! Aaargh. No. Now we have cleared up myth number six, we can say something intelligible about this so called 13th sign. It’s true that the constellation Ophiuchus touches the ecliptic (the apparent path of the sun), its feet trampling all over the Scorpion’s tail (literally and metaphorically). But what’s that to do with anything? You’re already wiser than to confuse constellations with the zodiac. The Babylonians were not blind. It is simply the Scorpion cluster that gave its name to the corresponding astrology sign of Scorpio and not Ophiuchus. And that’s that. Here’s another way to think of it. Would you ever dream of adding a 13th month to your calendar - or making some months run for 7 days and others for 40 - because someone who knew nothing about calendars insisted on it? Would you add a fifth season in the middle of winter simply because it got hot for three days? No. Calendars might be derived from observation but they are ultimately a symbolic system of measuring time. And so is astrology. The number 12 and its multiples is very important in measuring time since antiquity. And this, also, forms the basis of astrology with its 12 signs, the latter being only loosely connected to the constellations in the sky. 8. Astrologers, psychics, it’s all pretty much the same thing. This one is a really insidious falsehood and very damaging to astrology. For it assumes that astrology is nothing more than fortunetelling. Which it certainly isn’t. Or that astrologers say the first thing that comes to their head. Which they don’t. More insulting yet, it makes nonsense of the many hours of painstaking work and study an astrologer puts into analysing data before they even open their mouth. A psychic, by contrast, can deliver pronouncements on the spot. How good is the result? This depends on how good the psychic is. Or how good the astrologer. Same as when you go to a doctor, dentist, counsellor or car mechanic, really. So to repeat. An astrologer is not a psychic. A psychic is not an astrologer. One can have a whole career doing one but not the other. There can be psychics who’re also astrologers and astrologers who’re also psychics, of course. But the order is important. Say you were a psychic and a doctor, able to tell me what’s wrong with me just with one look. Would you then also go to the trouble to run tests? Perhaps. Just to be sure. But you’d be a psychic first and a doctor second. The same goes for a psychic who also uses astrology tools to enrich their skills. By contrast, a doctor who’s also ‘pretty intuitive’ would take a scientific approach to the matter, then only use their intuition later, when dealing with their patient directly. So would an astrologer who's also a bit psychic. 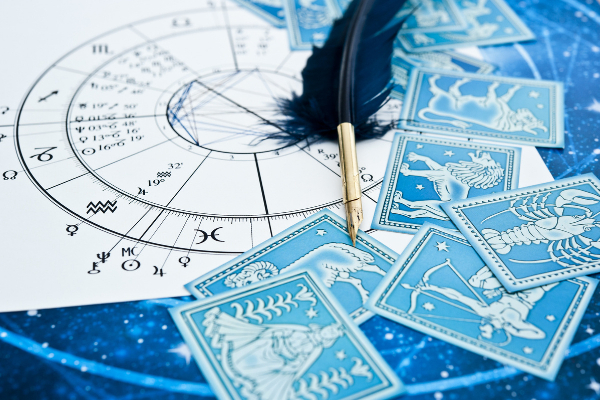 Here is another way in which astrologers and psychics are totally different. A doctor has studied the art for years, decades often before becoming a doctor. And so has a good astrologer. A psychic, by contrast, is commonly born that way. To talk with one of our gifted psychics (who are not necessarily astrologers) dial 0207 111 6304 from the UK or 1877 608 3731 from the USA! 9. Belief in astrology presupposes that life is fated and there's no free will. No-no-no-no-no. On the contrary. Astrology is a tool for self knowledge allowing you to exercise your free will! Because the only thing that stands between you and freedom is your own blind spots, delusions and negative expectations, your demons and complexes. And the very reason for studying astrology is so that you can master yourself and your fate. You cannot fight what you do not see. You cannot heal what you do not understand. Astrology opens your eyes to what’s there and brings understanding, opening the way to true freedom of the will. So, is there such a thing as destiny or fate? Well, certain external characteristics are arguably beyond our control, like having been born in a war zone or being born a boy or girl. Yes. We do not control everything. And some such things create a powerful dynamic inside of us. But we do choose what we do with that dynamic. Heraclitus said, character is destiny. And so here is the answer. Master your character and you master your destiny. This is what astrology is all about. 10. There are good and not-so-good transits / signs / aspects in astrology. Not really. Stereotypes narrow the mind and astrology is no exception. Nothing is intrinsically good or evil in astrology. Everything has a time and place. And everything depends on how you use it. For instance, Jupiter transits are often caricatured as good and Saturn transits as bad. But planets are neither good nor bad. Jupiter symbolises ease, growth and expansion. Good things right? But how fortunate is it when it’s your debt that’s expanding or your waistline? Or when everything comes so easy that nothing makes you happy? Saturn symbolises discipline, patience and commitment. But isn’t this exactly what you need if you’re working toward your perfect body or building a business or getting married? These things all require daily discipline, commitment and patience. They take work but you have something of immense value at the end. Restriction is not always bad. Expansion is not always good. Taking stereotypes to the extreme some people will vilify certain signs, saying for instance that all Geminis are two faced or that all Scorpions are evil. What a load of twaddle! Some of the most honest people we know are Gemini. And some of the kindest are Scorpio… till you cross them one time too many, that is. But who’s to blame then, eh?